Two weeks after our successful (if a bit brushy at times) outing on Whiteface and Esther, we were back in the Adirondacks again. 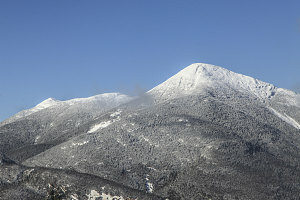 Today's objective was straightforward and prominent: the highest peak in all the state of New York - Mount Marcy. Jenn had been indicating for some time that she was interested in doing an ascent of Marcy that did not involve a complicated multi-peak and/or bushwhack ordeal, and an ascent where being at the top resulted in actual views, instead of in a white-out. So, we waited, looking carefully for a forecast that ensured a view. Just the right forecast came along for Saturday, Feb 4, 2012. I just had to throw something a touch nonstandard into the mix, so we opted not to start at one of the typical trailheads one takes to get to Marcy (usually Adirondak Loj, but sometimes also Upper Works or the Garden). 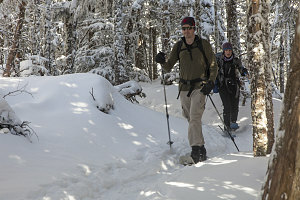 Instead, we opted to start at South Meadows road, using cross-country skis to get us to Marcy Dam, where we would then switch to snowshoes and continue along the Van Hoevenberg trail to the top. Even though this route is a mile or two longer than the shortest route via Adirondak Loj, we felt that travelling on skis would more than make up, timewise, for the extra distance. And, it would serve up a pleasant mixing of snowshoeing and skiing, providing a bit of the so-called 'multi-modal' experience. Along for today's journey was friend and fellow colleague Andy Brown. He had harboured a desire to climb Marcy, and the addition of the skiing approach only further sealed his wish to participate. Starting off from the end of the South Meadows road (a few years ago vehicular access along the South Meadows road was ended), we skied up on a very thin but fresh coat of new snow -- perhaps 2 inches' worth, and just barely enough for skiing. Underneath the snow was a rock-hard sheet of ice. 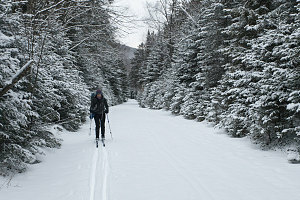 We hoped that there would be enough snow to allow us to ski all the way to Marcy Dam. Letting Andy take the lead with the backcountry skis he had rented, we skied along the road to the point where the gated South Meadows fire road angles off to the right. We stopped briefly at the trail register, then continued over the bridge crossing South Meadow Brook. There was amazingly little snow base about, both on the road or in the surrounding forest. 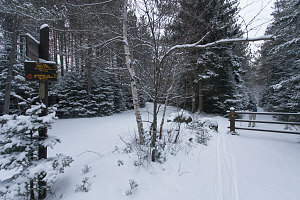 The two inches of fresh snow allowed us, just barely, to make our way along on skis. Even so, every once in a while we would feel our skis grab onto a pebble or branch on the underlying ground. As a result, our speed or enjoyment of the skiing was not as good as it could have been - we instead had to very gingerly move along, looking to avoid rocks, dirt and other little obstructions. 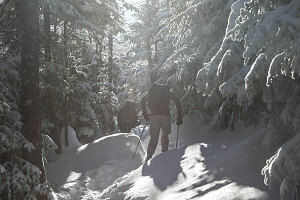 As the old fire road gradually ascended towards Marcy Dam, the snow became marginally deeper, enough so to improve the conditions for skiing to a point where we weren't worrying as much about chewing up the bases of our skis. Although we did not make the kind of speed one would normally expect from being on skis (due to the somewhat marginal conditions), we still travelled faster than if we had been on foot. 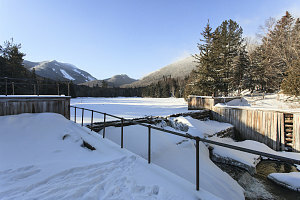 Presently we arrived at Marcy Dam, noting the changes that had recently come about due to Hurricane Irene's visit last September: both the new trail route for the main trail from the Loj and the damage to the central part of Marcy Dam itself. 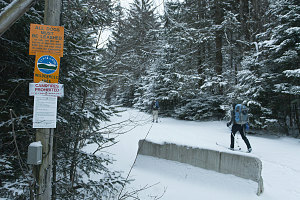 The default plan had been to switch to snowshoes at Marcy Dam; Although the Van Hoevenberg trail is a backcountry ski trail as well as a hiking trail, two of the three of us did not have the right kind of skis; and, with the super-thin snow base, we weren't sure if it would be skiiable at all. Nevertheless, we decided to try skiing up as far as we could, and change over only then. That 'then' turned out to be very soon. 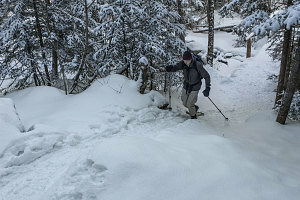 Only a few hundred yards up the Van Hoevenberg trail, it became very apparent that the complete lack of any significant snow base meant that every single dip, root and rock was a full-blown obstacle - for a ski. 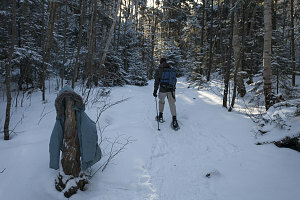 There was no further question about it: we stopped, hid our skis off in the woods, and switched over to snowshoes. We could have also just as easily put on some microspikes or yaktrax and hiked up this section of trail, too - basically it was a dusting of snow over icy bits. Now on showsoes, we hiked briskly up the first gentle grade of trail between Marcy Dam and Indian Falls. Nothing much to report about here, other than the fact that most of the ups, downs and boulders of the trail have not been substantially covered by winter's mantle. 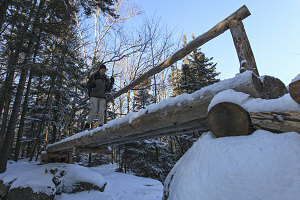 We reached the point at which the Van Hoevenberg trail crosses Phelps Brook shortly before 10am. This points marks the first real bit of steepness along the trail, climbing up about 700 feet in less than a mile to Indian Falls. 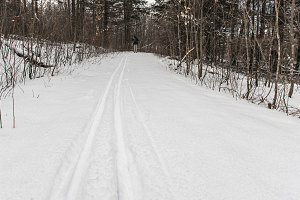 The Van Hoevenberg trail diverges into two trails along this stretch - a hiker-specific version and a ski-specific version. As we climbed the twisty-turny hiker-specific track, we noticed that a meaningful snowpack was starting to form. 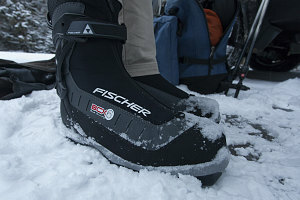 Much better for the snowshoes than scrabbling along over ice, rock and dirt. 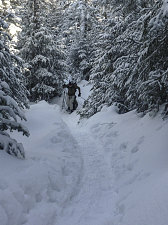 Apart from a few starts and stops to adjust snowshoe straps and bindings, we motored along at a quite brisk pace. On the steeper slopes leading up to Indian Falls, we passed several groups of other hikers. 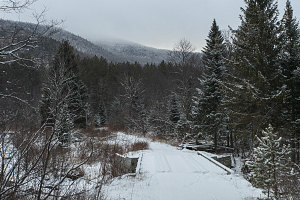 The forecast had been for a beautiful and moderate winter day, and Mt Marcy is a prominent destination, so the fact that a fair number of other hikers were on the trail today that was not at all surprising. The trail levels out just before Indian Falls. Fresh snowshoe tracks continued up the Van Hoevenberg Trail, but no one had yet broken out the path to Indian Falls [since the last snowfall]. Indian Falls, however, is a superb lookout, and so we took the time to walk the 15-second distance over to the open space at the top of the falls. We weren't disappointed: on a beautiful day like today, Indian Falls provides the most perfectly-framed view of the MacIntyre Range that there is. 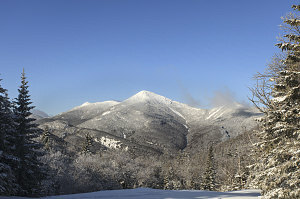 Algonquin, Wright and Iroquois gleamed a clean, pure white in the morning sun. After a short picture-snapping session at Indian Falls, we continued on our way. Here at 3700 feet, there was now a decent snowpack, and the trail was in great shape - firm but not hard, well-packed out and not with any annoying post-holes. We did not encounter any blowdown, and clean, fresh snow covered everything. We cruised along rapidly on the moderate grades that exist along the trail above Indian Falls. At around the 4,000 foot mark, the Van Hoevenberg trail makes its second steep-ish ascent, this time climbing up to the crest of a 4,500-foot un-named ridge just to the north of Mount Marcy. It is along this stretch that one gets the first limited views, looking northeast towards Big Slide Mountain. The thickness of the snowpack increased dramatically here, and finally it felt like proper winter conditions in the Adirondacks. 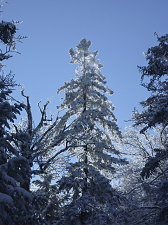 The predominantly coniferous trees here were very attractive, each branch covered in a thick mantle of snow.